Nicolas Hasler played in Chicago's first three league games this season before joining Sporting KC. 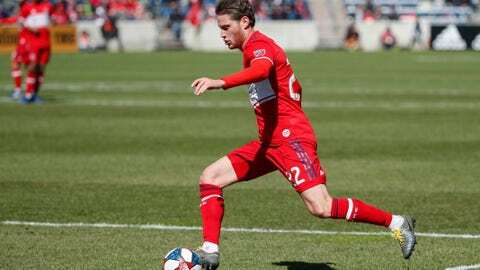 Sporting Kansas City has signed defender Nicolas Hasler, who opened the MLS season with the Chicago Fire, the club announced Tuesday. Hasler’s contract runs through the end of the 2019 MLS season. He has been added to the Sporting KC roster and will occupy an international roster spot. Sporting KC also announced Tuesday that forward Daniel Salloi has obtained his green card and no longer occupies an international spot on the club’s roster. Sporting now has eight international players on its roster: Hasler, Botond Barath, Yohan Croizet, Andreu Fontas, Felipe Gutierrez, Krisztian Nemeth, Johnny Russell and Abdul Rwatubyaye. Hasler, 27, has made more than 200 club appearances since turning professional in 2009. He spent the first eight years of his career in his native Liechtenstein, where he was one of the country’s most decorated players this decade. Hasler was named Liechtensteiner Footballer of the Year in 2015, 2017 and 2018. Hasler has played in 39 MLS matches split between Toronto FC from 2017-18 and the Fire from 2018-19. Last July he was traded from Toronto to Chicago, where he started eight of 10 MLS matches to end the season. He played in Chicago’s first three league games this season before joining Sporting KC.